How to get your arrows to "Fly Like Darts"
This fletched sharpened lead pencil is a great example of the average hunting arrow in use today. It’s light weight and has a rather low FOC (Forward of Center) balance. Now imagine tossing this fletched pencil at the dartboard. It would appear to fly okay and because of its light weight, have a fairly flat trajectory. However, it wouldn’t hit the dart board with much force because of its light mass. Common sense would tell us if we want this pencil to strike with more force, we need to throw it faster. The higher velocity pencil strikes the dart board with much more authority but we find out because it’s low FOC, the shaft of the pencil doesn’t follow the point, making it unstable in flight. It may even strike the board sideways. 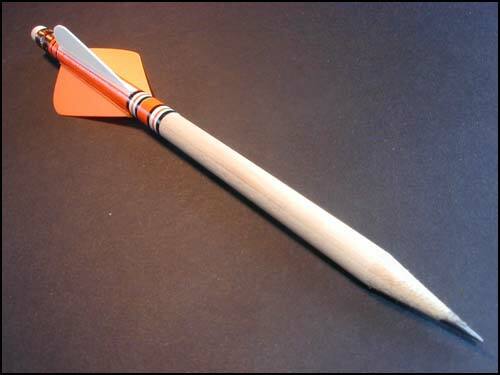 Light weight arrows with a low FOC are very much like this fletched pencil. They have a flat trajectory and are fast but have poor penetration because of low mass and unstable in flight. Whether the arrow shaft is made of carbon, aluminum or wood, like the pencil, it has the same amount of mass weight per inch and a point of fairly light weight. This type of arrow generally get the job done when everything goes right but if it encounter brush, bone or even thick hide and hair, it may not have enough mass/energy to push the broadhead to the vitals. If you shoot it from a fast bow you'll find that it's not very stable and like a fast, light, rifle bullet, it doesn't take much to deflect it off course. With the average 125 grain point on an arrow like this, the FOC is around 10%. Not bad, but not great. It takes game if everything goes right but it doesn't have much penetration. Light, fast arrows with low FOC are like this. They offer average performance at best. The steel shaft of this nail is about four times heavier than the wooden lead pencil so its trajectory will not be as flat; however, because of the increased mass, it will hit the board with much more momentum and have greater penetration. 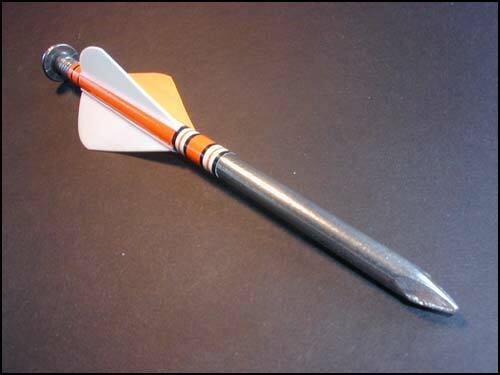 This fletched nail is an example of a carbon or aluminum shaft with added internal weight tubes. It is important to understand that the weight is added equally to the entire length of the shaft. The total arrow mass has increased but unless you increase the point weight dramatically, the FOC doesn’t change. Now you're shooting an arrow that isn't any more stable in flight and relies almost totally on the mass of the arrow shaft to push the broadhead through game. The nail has an improved mass advantage over the pencil and therefore greater potential for improved penetration. It’s a good step up for bowhunting but still falls short of ideal arrow design. Now take a look at the standard throwing dart. See how this tapered design has most its mass up front? The rear of shaft is light weight and only needs minimal fletching. 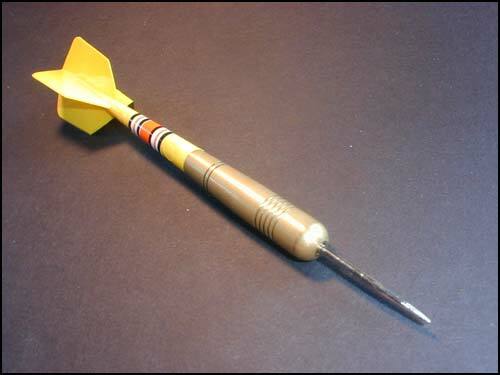 Imagine throwing this dart at the board and see the difference over the pencil and nail. Its design has a heavy forward (FOC) portion that is actually pulling the shaft in its trajectory arc rather than the pencil and nail, which is a shaft that is pushing a point. Engineers will tell you that a pulling engine is much more efficient than pushing engine. Its flight is smooth and stable, therefore has much better accuracy and it hits the target with authority. Go ahead, throw it harder and faster. It still flies perfectly and makes a resounding 'thunk' when it hits the board. The GrizzlyStik arrow is very much like the throwing dart. Its design has a thicker, heavier and stronger forward end that tapers toward the rear. The front of the shaft gives it great strength right where we need it most, right behind the broadhead. Also, it has a brass point insert which is 3 times heavier than the standard point inserts used in other arrow. Having all that mass weight toward the front not only gives the GrizzlyStik a high FOC, we've built-in Extreme FOC (EFOC). Why are airplanes designed with EFOC? Why are darts designed with EFOC? Because its a superior design for stable flight. There's no down side to shooting a tapered arrow with EFOC. It offers stable flight and near instant recovery from archer's paradox and impact vibrations. That means more energy retained by the arrow to deliver upon impact. In other words, more energy to blow through your animal no matter where they're hit. 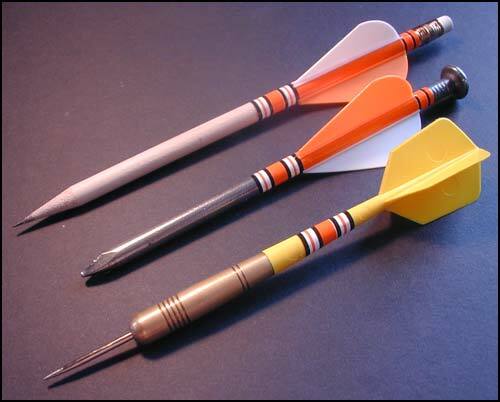 Now, like the dart, the light tail end of the arrow simply follows as the extreme weight forward arrow pulls it not only through the air, but through thick hair, hide and bone. Speaking of bone, the taper of the shaft gives us another penetration advantage. As the diameter of the shaft gets smaller, there's less friction against bone that might try to pinch the shaft. This reduces potential friction and allows more pass-throughs. The clear winner in this case is our GrizzlyStik tapered carbon arrows. When we say our GrizzlyStik’s fly like darts, we mean it!